My first introduction to seeing a purse frame in person occurred a very long time ago on a trip to England. I was wandering around the Victoria and Albert Museum when I discovered a display in the Bronze Department of a purse frame with Niello inlay. Niello is a decorative metal working technique that is used to create contrast on metal surfaces (for more information read this blog). The purse frame was not complete, and I admit that I only had a vague concept as to how it worked, but I remembered the little metal frame coin purses that were popular when I was a little kid, and I knew that it had to be similar. A few months later I was in the midst of the year long Arts and Sciences Competition in the West Kingdom, known as the Golden Poppy. 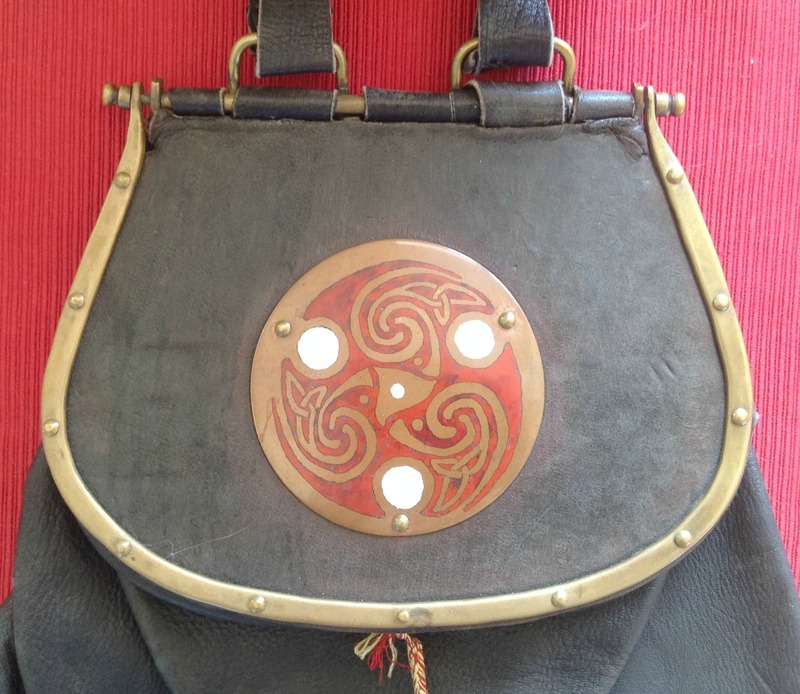 I wanted to make a purse with a frame, and I knew about the purse lid from the Sutton Hoo. I really wanted to do something Viking, but I couldn’t find anything like this, so I settled for Anglo Saxon. The fact that I even looked for something like this from the Vikings really shows how little I understood about Viking technology and working styles, but that is another blog. So, based on what I knew about the purse frame that I saw in England, purse frames that I was able to find in books, and the Sutton Hoo Purse Lid, I made a purse. I wrote a blog to give detailed photographic views of the purse. Here is the first part, and here is the second part. If you are interested in the original detailed documentation here are the links to read it. It includes all of the steps, why I did what I did, and the bibliography. If you are interested in understanding the basic process of enameling, which I used to decorate the disk on the lid of the purse, here is a blog explaining the process. This entry was posted in Leather Purse or Belt Pouch With Brass Frame, Metal Casting, Metal Working, SCA Life and tagged Anglo Saxon Purse, Leather Purse, Medieval purse, metal frame purse, Sutton Hoo purse by Eirny. Bookmark the permalink.